It’s interesting comparing WVARA’s band results from 2014 through 2017. The sunspots may have clearly taken their toll, but we’ve made impressive improvements over the years on 40 and 80 meters — and 2 meters also. …for a total QSO count of 1971 (after several dups were removed). I then tallied up 1 pt per SSB/FM contact and 2 pts/QSO for CW and Digi to get a base QSO score of 16,650 (which includes the GOTA QSOs). Adding in 2600 bonus points (emergency power, public location, satellite, etc) got us up to our 19,250 grand total score. I will crunch up some charts showing QSO rates and qtys by hour, but this is what they will all add up to. I must thank each and every one of you for the dedication and effort you each put forth through this event. It never ceases to amaze me how much A Game each of you brings. Tower trailers, networks, radios, tents, antennas galore, intense operating skills, and all the glue in between. Quite a lot happens to make this one day event successful. Little things like falling masts, dead batteries, and no sleep just don’t slow any of you down. Major kudos to Bobby Barnett and Bill Fehring for organizing and running WVARA’s Field Day event on Mora Hill this weekend. You guys did a really great job! 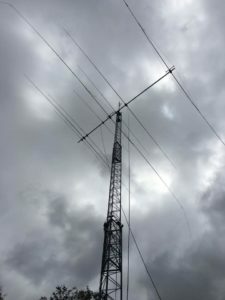 Likewise, many thanks to Kevin Smith for running/coaching the great GOTA station, and to Svend Jensen for getting all the big towers / antennas successfully installed. And a special thanks to Greg DesBrisay for stepping into my shoes to test/deploy/maintain the three stations in CW station. Pre-Field Day Antenna Party #2. 4-band Yagi! Photo by Greg DesBrisay. 2017 Field day is June 24 – 25.